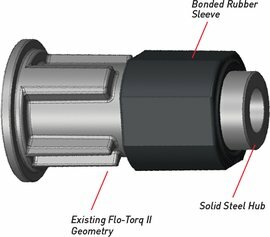 Mercury Marine, the world leader in marine propulsion and technology, introduces the Flo-Torq SSR HD, a propeller hub system designed to improve shift noise and vibration on high-horsepower outboards that use a heavy-duty 1.25-inch propeller shaft. This new hub system is the first of its kind to employ Mercury’s new SSR technology. SSR stands for Soft Shift Rubber, which delivers a 25 percent improvement in shift noise and vibration during shifting events. The SSR hub delivers these benefits without sacrificing the strength and durability of a solid hub designed for high-performance marine engines. The SSR system starts off with a traditional solid steel hub, but adds a bonded rubber sleeve to one end of the hub that provides cushioning to the system. The bonded rubber sleeve cushions the propeller during shifting events, absorbing shock and vibration. As soon as the propeller is under load, the stainless steel end of the hub engages the core of the propeller, creating a solid hub that can reliably transfer the significant power generated by today’s FourStroke outboards.